Stamford Talk: Eat, Think, Drive, Blog! : Being "That Parent"
You know how you sometimes see parents do stuff you think YOU'D never do? Like letting a kid play a video game at dinner? Or letting your kid scream at the library? Or, letting a kid run amok, ripping stuff off shelves, while you chat with your friend? Now, I'm not necessarily saying I've done those things, but I did have a moment last weekend when I saw a couple looking at my family as if we were "those horrifying people." It does involve letting my baby play an iPhone app at dinner, but let me give you some background. In early August the toddler and I flew to California to visit my sister, just me and him, with- horrors- a layover. With the thought of seven hours in a plane, and an hour layover, I armed myself with all the things I could to keep him busy: food, drink, books, stuffed animal, and iPhone apps. Most parents do videos, but I didn't want to deal with bringing a laptop for that, since I didn't want to have to put it in and out of the backpack at security. I already had to deal with kid and carseat, so I figured I could make the iPhone work. 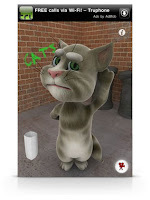 One of the apps I got for him is Talking Tom- a cat that repeats what you say. You can also knock him out if you poke him in the face repeatedly. Well, since my kid only says like 15 words, he preferred to mostly knock the cat out. Oh- and shriek at it. The app was a moderate success on the plane- I had to limit his time with it because of the shrieking, plus I was a little freaked out by how addicted to it he (and my sister's older 3 kids- yes she now has 5 kids age 7 and under) became. So, cut to last weekend. We were out for what we thought would be a quick dinner. The kid, as usual, was doing great, snacking and being pretty quiet. Something weird happened to our order, though, and our entrees took 45 minutes to arrive. The kid had been in the stroller for a while, then in his dinner seat for an hour, and was getting restless and fussy. I didn't want to get him out of his seat because he's way too active and crazy to let walk around a non-baby safe area, so to calm him down, I gave him the drug- I mean, iPhone. 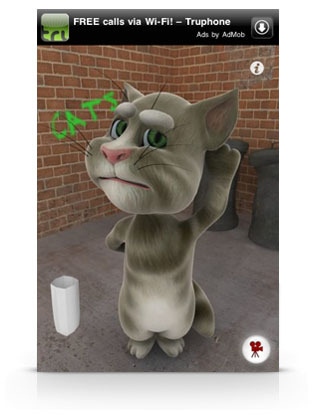 He immediately became deliriously happy and started punching Talking Tom in the face. I noticed the lady across from me turning to look at my kid, then turning back toward her date, and then they both looked back at us. It was an "Oh my god" look, rather than a "Oh how cute and funny" look. I could totally see that she saw us as "those awful people that let their kids play video games." And even worse, a very young kid. I feel a little bad about that, but then I think, "Whatever." I don't see how you can expect kids (and active boy toddlers) to do ridiculous things like ride in a plane for 7 plus hours, or sit in a in a seat or stroller for almost two hours, without doing something equally ridiculous like letting them play with your iPhone. It's hard to live a balanced life as a parent without doing a little crappy parenting here and there. By the way, the flights turned out well. On the way out he slept a lot since he'd woken up at 3am to make a 6:45 flight- and on the way back, not only did we have new iPhone videos of him and his cousins to watch, he'd also learned from his cousins how to jump off stuff, so he spent several minutes jumping off the armrest into his seat. Our flight home landed at- ugh- 11pm, and although he was crabby, he spent, no joke, 30 of the last minutes quietly buckling and unbuckling our ERGObaby carrier. The kid's a champ. LOL. I've actually been considering getting the kids their own refurbished iTouch so they can store their music, audiobooks, games, and--on special occasions (like long plane rides) TV shows or movies. There was probably a time I looked askance at other parents who did something like this but whoa Nelly, that time is far past! I barely had the attention span to last a recent trip to CA without an iphone, ipad and my headseat plugged into the airplane music. Basically what I'm saying is you and your son put me, a 30-year old woman, to shame! I give you moms a lot of credit, it can't be easy. Don't think twice about it. You did your best and used the iPhone as a last resort. Honestly, I refuse to look other people in the eye when my kid is acting out in public. Otherwise I'm bound to say something snarky like, "oh, I'm sorry - did you want to come over here and try to deal with this?" Next time, ask them if they would rather he be having a melt down and ruining their dinner. Works like a charm.... I have gotten ballsy since becoming a mommy. Oh, and I need that app!